Should The Saying Go “Drive For Dough And Putt For Show”? To reach this conclusion, I quantified the relationship between how players finished (place) in the 2018 Las Vegas Challenge, and the 2017 and 2018 Memorial Championship, and their long, intermediate, and short distance accuracies. 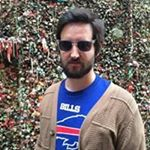 All of the data are from UDisc Live. The major patterns in these data can be seen in the plot below that shows what I call long, intermediate, and short distance accuracy scores for players that finished in the top-10 of these three tournaments. The long distance scores reflect players’ abilities to hit fairways, greens in regulation, and park holes. The intermediate distance scores reflect players’ abilities to scramble and hit circle 2 putts. Short distance scores are based on circle 1 putting.2 The mean score for each distance is 50 and the maximum score is 100. For long distance accuracy, the median (middle) score for top-10 players was 87 and no one had a score even close to 60, which indicates that top-10 finishers were well above average (50) in this statistic. Paul McBeth’s score from the 2017 Memorial Championship is a good example. It was 100 and he, of course, won the tournament. 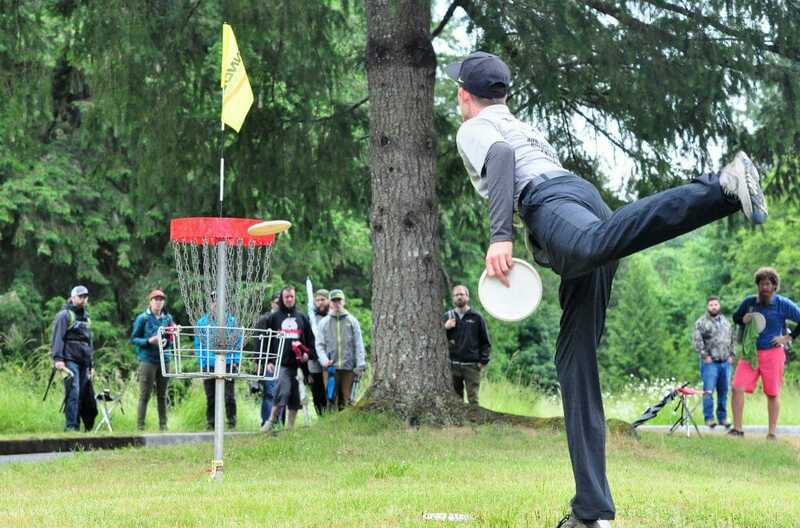 For further reference, the winner of the Memorial this year, Simon Lizotte, had a score of 100, as well. The data points are more scattered for intermediate than long distance and the median score is 67, meaning that players in the top-10 still did well in this category. For short distance accuracy, the scores are spread even more, with a median of 70 and a minimum value of 26. This means that some players did significantly worse than average in terms of circle 1 putting and still make it into the top 10. 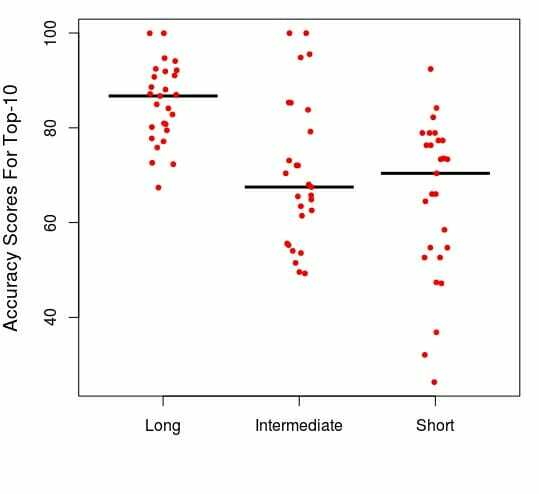 The large variance in the short and intermediate scores as compared to those for long distance accuracy indicate their proportionate lack of importance as predictors of success in these events. To further illustrate this, I generated a model3 that calculates win percentage (probability) by short, intermediate, and long distance accuracy score. What you see in the plot is that win percentage increases the most as long distance accuracy goes up and the least as short accuracy increases. 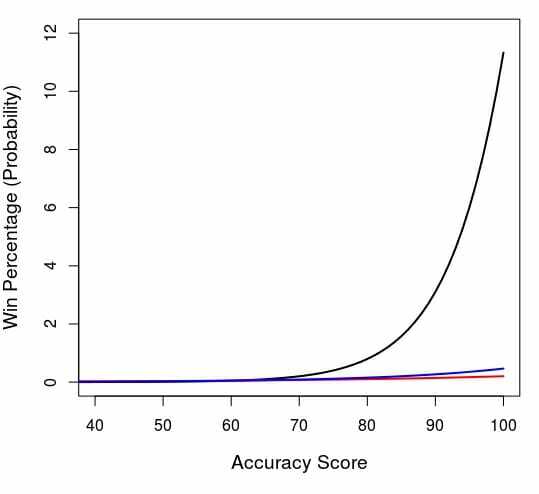 A player with an intermediate or short accuracy of 100 does not even approach a 1%-win percentage, but an individual with a long distance accuracy score of 100 is well over 10%. This means accuracy from longer distances was far more predictive of success. It is critical to mention some of the limitations of these data. One such limitation is the relative crudeness4 of the statistics. For example, the intermediate accuracy scores do not include some measures of what one would think of as intermediate distances, such as second throws on par 4s or 5s. And the short distance scores do not control for length of circle 1 putts. This is important because circle 1 putting percentages are likely inflated somewhat by those players that take more shots to reach the green and, therefore, often have shorter upshots and putts on average. In short, if specific location and distance data between each shot was available this, and similar analyses could be refined further. A second potential limitation comes from the style of courses in play at each of these events, given that they are generally open, lacking in an abundance of vertical obstacles, like trees. The differences between more open and more wooded courses could certainly lead to some variance. Despite the limitations, what meaning can we extract from these results? Well, perhaps for open courses, likes those at the Las Vegas Challenge and Memorial Championship, they mean that the old saying is wrong. Instead, it should go “you drive for dough and putt for show”! The next big tournament, the Waco Annual Charity Open will be an interesting test case for this pattern, as it is a course with a front nine that is relatively wide open—but slightly less so than the Las Vegas and Memorial courses—and a back 9 that is heavily wooded. Perhaps the back nine results will dictate the need for skills very different from those demonstrated by players that have dominated the podium so far this season. Once that tournament is complete, we will have two tournaments worth of data from both Waco and the 2016 and 2017 Vibram Open on the wooded Maple Hill course with which to examine this pattern and compare it to these results from the LVC and The Memorial. Aaron Howard is a Visiting Assistant Professor at Franklin & Marshall College. He loves to play disc golf and to think about things he loves quantitatively. Contact him at ahoward1@fandm.edu and follow him on Instagram. Comments on "Should The Saying Go “Drive For Dough And Putt For Show”?"